Clearly, further advances in fundamental physics are required before it will be possible to know the ultimate fate of the universe with any level of certainty. However, scientists generally agree that this fate will depend on three things: the universe’s overall shape or geometry, on how much dark energy it contains, and on the so-called “equation of state” (which essentially determines how the density of the dark energy responds to the expansion of the universe). 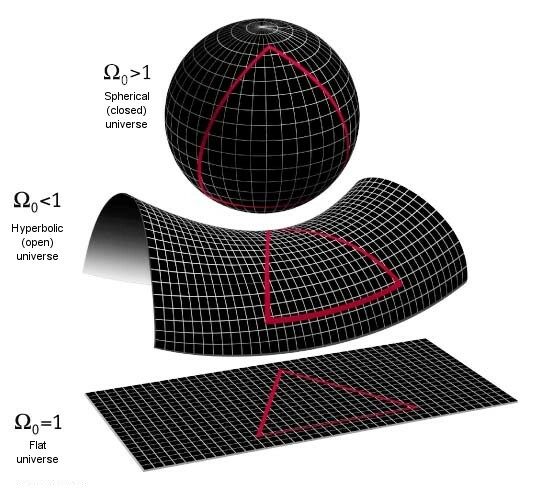 If the geometry of the universe is “closed” (like the surface of a sphere), then there are two main possibilities, as has been mentioned in the section on Accelerating Universe and Dark Energy. If the universe has a large amount of dark energy (as recent findings suggest it may well have), then the expansion of the universe could theoretically continue forever. 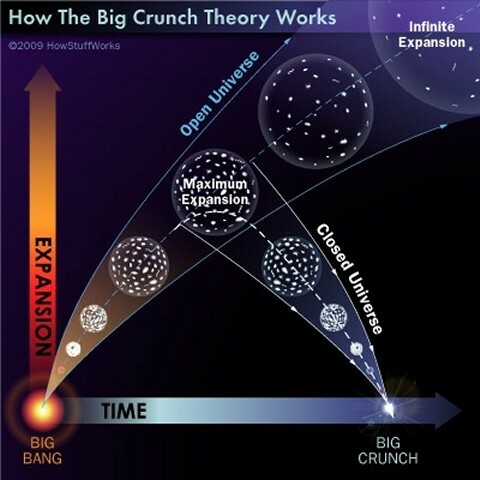 If, however, the universe lacks the repulsive effect of dark energy, then gravity will eventually stop the expansion of the universe and it will start to contract until all the matter in the universe collapses to a final singularity, a mirror image of the Big Bang known as the "Big Crunch”, somewhere in the region of a hundred billion years from now. Models of a collapsing universe of this kind suggest that, at first, the universe would shrink more or less evenly, because, on a gross scale, matter is reasonably consistently distributed. At first, the rate of contraction would be slow, but the pace would gradually pick up. As the temperature begins to increase exponentially, stars would explode and vaporize, and eventually atoms and even nuclei would break apart in a reverse performance of the early stages after the Big Bang. As the universe becomes compacted into a very small volume, any slight irregularities will become ever more magnified and, in the final stages, the collapse will probably be wildly chaotic, and gravity and the warping of space-time will vary immensely depending on the direction the singularity is approached by an in-falling body. According to some predictions, very close to the singularity, the warpage of space-time will become so violent and chaotic that space and time will actually “shatter” into “droplets” and all current concepts of time, distance and direction will become meaningless. This model offers intriguing possibilities of an oscillating or cyclic universe (or “Big Bounce”), where the Big Crunch is succeeded by the Big Bang of a new universe, and so on, potentially ad infinitum. However, in the light of recent findings in the 1990s (such as the evidence for an accelerating universe described previously), this is no longer considered the most likely outcome. If, on the other hand, the geometry of space is “open” (negatively curved like the surface of a saddle), or even “flat”, the possibilities are very different. Even without dark energy, a negatively curved universe would continue expanding forever, with gravity barely slowing the rate of expansion. With dark energy thrown into the equation, the expansion not only continues but accelerates, and just how things develop depends on the properties of the dark energy itself, which remain largely unknown to us. One possibility is where the acceleration caused by dark energy increases without limit, with the dark energy eventually becoming so strong that it completely overwhelms the effects of the gravitational, electromagnetic and weak nuclear forces. Known as the “Big Rip”, this would result in galaxies, stars and eventually even atoms themselves being literally torn apart, with the universe as we know it ending dramatically in an unusual kind of gravitational singularity within the relatively short time horizon of just 35 - 50 billion years. Perhaps the most likely possibility, however, based on current knowledge, is a long, slow decline known as the "Big Freeze" (or the “Big Chill” or “Heat Death”). In this scenario, the universe continues expanding and gradually “runs down” to a state of zero thermodynamic free energy in which it is unable to sustain motion or life. Eventually, over a time scale of 1014 (a hundred trillion) years or more, it would reach a state of maximum entropy at a temperature of very close to absolute zero, where the universe simply becomes too cold to sustain life, and all that would remain are burned-out stars, cold dead planets and black holes. What happens after that is even more speculative but, eventually, even the atoms making up the remaining matter would start to degrade and disintegrate, as protons and neutrons decay into positrons and electrons, which over time would collide and annihilate each other. Depending on the rate of expansion of the universe at that time, it is possible that some electrons and positrons may form bizarre atoms billions of light years in size, known as positronium, with the distant particles orbiting around each other so slowly it would take a million years for them to move a single centimeter. After perhaps 10116 years, even the positronium will have collapsed and the particles annihilated each other. In this way, all matter would slowly evaporate away as a feeble energy, leaving only black holes, ever more widely dispersed as the universe continues to expand. The black holes themselves would break down eventually, slowly leaking away "Hawking radiation", until, after 10200 years, the universe will exist as just empty space and weak radiation at a temperature infinitesimally above absolute zero. At the end of the universe, time itself will lose all meaning as there will be no events of any kind, and therefore no frame of reference to indicate the passage of time or even its direction. Interestingly, recent analyses from the WMAP satellite and the Cosmic Background Imager, seem to be confirming other recent observations indicating that the universe is in fact flat (as opposed to closed or open). These experiments have revealed hot and cold spots with a size range of approximately one degree across, which, according to current theory, would be indicative of a flat universe.